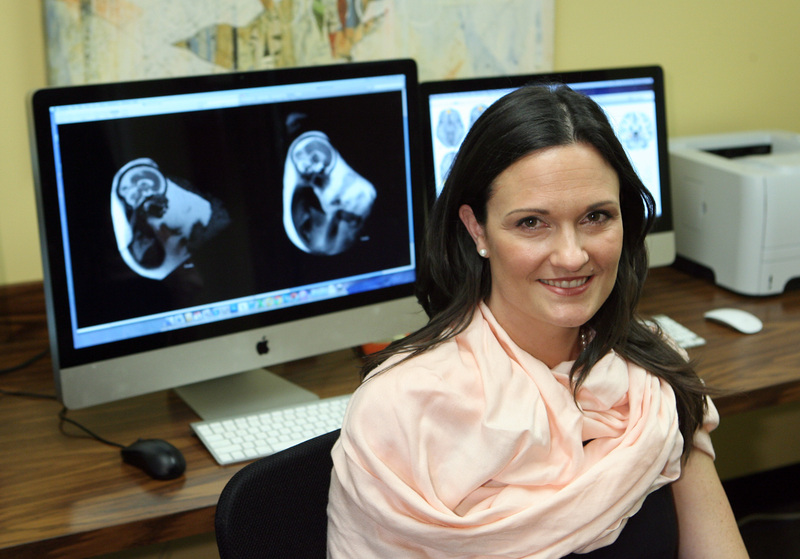 DETROIT – Wayne State University neuroscientist Moriah Thomason, Ph.D., was awarded a five-year, $2.3 million grant to study the functional development of the human fetal brain and correlate it to behavior at age 4. The grant is an Innovative New Scientist award through the National Institute of Mental Health (NIMH) of the National Institutes of Health, reserved for productive, early-stage investigators implementing high-impact, novel research. Thomason is jointly appointed to the Merrill Palmer Skillman Institute for Child & Family Development (MPSI) and the Wayne State University School of Medicine, and is director of the perinatal neural connectivity unit of WSU’s Perinatology Research Branch. The project, “In Utero Assessment of the Human Neural Connectome and Later Child Behavior,” takes advantage of recent technology that allows noninvasive imaging studies of coordinated function in the living human fetal brain. Compelling evidence indicates that psychiatric and developmental disorders are generally caused by disruptions in the functional connectivity of brain networks. An MRI of resting state functional connectivity (RSFC) has multiple inherent advantages, especially in studying the fetal brain. Within minutes, robust information about global connectional properties can be assessed while subjects rest or sleep. Using RSFC MRI, the team will study brain function in the typically developing fetus and in children at high risk due to maternal stress. In the typically developing group, Thomason and her team will attempt to determine whether there is a convergence of brain development — between 25-week gestation to 12 weeks old — toward globally coordinated function. They will also test whether brain activity between cognitive networks becomes more interrelated during this period. Thomason’s co-investigators are Chris Trentacosta, Ph.D., associate professor of psychology in Wayne State’s College of Liberal Arts and Sciences and affiliate faculty member at MPSI; Catherine Monk, Ph.D. of Columbia University; and S. Alexandra Burt, Ph.D., of Michigan State University. The Merrill Palmer Skillman Institute for Child & Family Development promotes and improves the well-being of children and families across the lifespan through research, education and outreach. The institute is part of Wayne State University, a premier urban research institution offering more than 360 academic programs to more than 27,000 students.